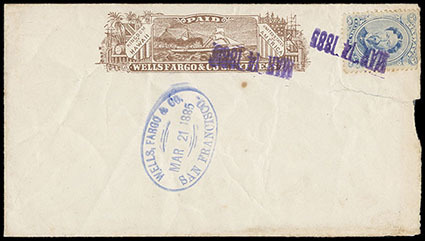 Hawaii, Wells, Fargo & Co., Honolulu, Hawaii, Mar 2, 1884, purple oval date stamp cancelling on 1884, 10¢ black entire to San Francisco, Cal., with express frank not contemporarily applied and blue San Francisco oval receiving date stamp which certificate states is a counterfeit, Extremely Fine appearance; with 1998 P.F. certificate. Scott No. U9 Estimate $300 - 400. 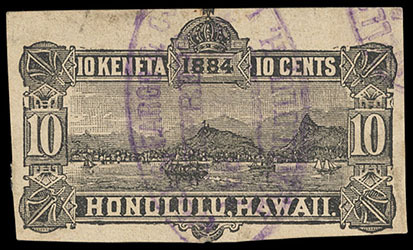 Hawaii, Wells, Fargo & Co. Express, Honolulu, H.I., purple oval date stamp (Gregory AUXEXP-WELLS (shaded express dated), 1RRRR) on 1884, 10¢ black cut square, a Very Fine strike, very rare. Scott No. U5 Estimate $250 - 350. Hawaii, Wells Fargo & Co's. 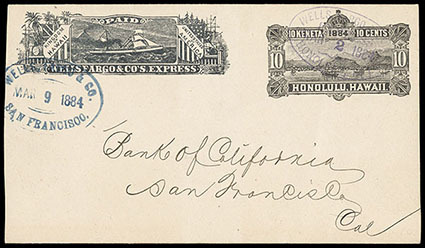 Express, printed brown Hawaiian paid frank on blue inside cover used as a part paste-up, bearing 5¢ ultramarine (39) tied by purple "Mar 14, 1885" straightline cancel and additional strike cancels frank, blue "Wells, Fargo & Co., San Francisco, Mar 21, 1885" oval date stamp at center; sealed tear and partial backflaps due to paste-up usage, F.-V.F. 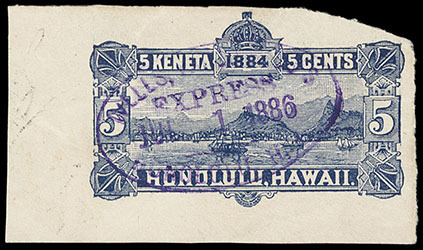 Hawaii, Wells, Fargo & Co. Express, Honolulu, H.I., Jul 1, 1886, purple oval date stamp (Gregory AUXEXP-WELLS(shaded express dated), 1RRRR) on 1884, 5¢ blue, blue inside cut square, Very Fine, very rare. Scott No. U8 Estimate $250 - 350.